TIM has been on the market since 2006 and, with more than 700,000 licenses sold and over 50 modules and functions, is the ideal complement to get the most out of CUCM. 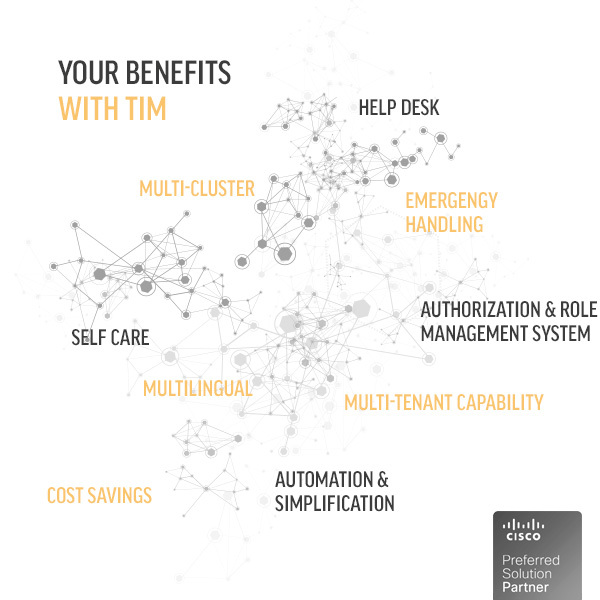 For these reasons, TIM is the ideal supplement for your CISCO UC environment. Your CISCO UC environment does not meet all the requirements of your company? You don’t want to use numerous add-ons from different vendors, because this increases the effort and costs immensely? But you still have to solve your problems? Then TIM is the right tool for you! TIM increases productivity, lowers operating costs and gives you unprecedented flexibility. With TIM, the CISCO Unified Communications Manager becomes a true all-rounder! TIM’s numerous intelligent modules expand the CISCO UC environment to meet extended requirements and create new capabilities. Productivity and user acceptance is increased to a maximum – all with just one 3rd party tool. With TIM, the Cisco Unified Callmanager becomes a multi-client capable UC platform. The role and permissions system allows the simultaneous use of a single CUCM for multiple customers. Of course, different privileges and functions can be defined by customer and group. TIM integrates itself so seamlessly into the UC environment that your users do not perceive the extensions as extensions at all, but rather appreciate the new capabilities as a matter of course: Because TIM supplements the CUCM with essential functions that users need every day in order to work effectively. The administration of the CUCM is significantly optimized by TIM. TIM establishes an unlimited number of authorization levels, from which all user groups benefit up to the end user. This means that an operation can be delegated to the helpdesk or executed by the end user himself. A much less complex interface, browser-based of course, makes the administrative tasks faster, more effective and less error-prone. Should something go wrong, deleted items can be restored for 30 days. The high level of automation eliminates many manual steps as opposed to working directly on the CUCM.